Boat dimensions: 5.5" x 4" x 2.75"
Packaged dimensions: 11.37" x 4.75" x 3"
Ahoy, mateys! 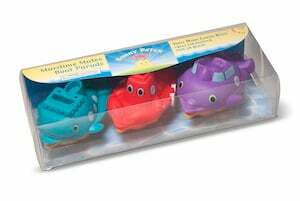 The Maritime Mates Boat Parade Kids Pool Toys have docked and include three boat-shaped water toys that will delight your little one has they embark on their maiden voyage to the swimming pool or home bath. These Melissa and Doug pool toys can be linked easily and sturdily in any order to brave uncharted waters. These Melissa and Doug pool toys are fun and encourage beginner swimmers to get their sea legs.